India, one of the founding Mission Innovation members, is bringing increased focus to their energy innovation activities through Mission Innovation. India will report annually on progress in delivering a national MI Action Plan and is communicating frequently on MI activity on Twitter @IN_MissionInnov. 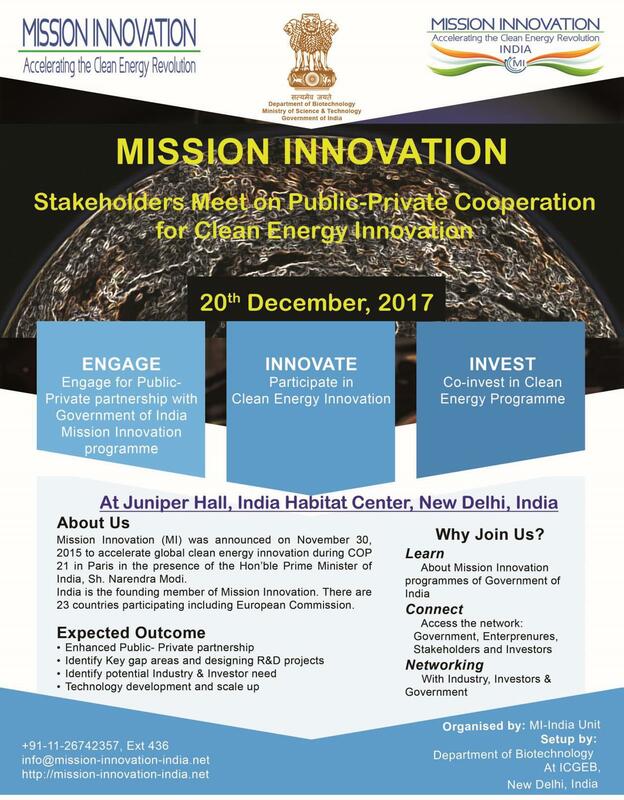 In recent months India’s Mission Innovation team has delivered a range of activities contributing to the achievement of Mission Innovation’s goals and accelerating the implementation of India’s clean energy innovation plan. These have included two highly subscribed international funding calls and national workshops on each of the seven Innovation Challenges. The international funding calls will allocate $10 million of public funding to support R&D projects focusing on Smart Grids and Off-Grid Access to Electricity – two of Mission Innovation’s seven Innovation Challenges, both of which India co-lead. 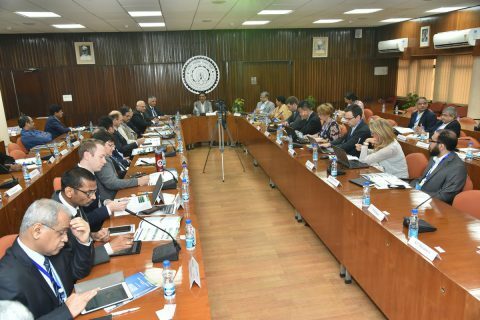 Institutions and industry from Mission Innovation member countries were invited to join partnerships with leading Indian institutes and organisations to carry out collaborative work with a view to accelerating innovation. The Indian Department of Science & Technology received proposals involving partners from 23 countries (including some countries which are eligible through the European Commission’s membership of Mission Innovation). The stage 1 proposals are currently being evaluated. The successful proposers will be invited to submit full proposals. It is anticipated that the results will be announced at the third Mission Innovation Ministerial in Malmo (Sweden) in May 2018. India expects to contribute further to the Mission Innovation goals of boosting public sector investment and new or strengthened cross-border networks and partnerships by launching further international funding calls once opportunities have been defined by the Innovation Challenges. Participants at the Second Mission Innovation Smart Grid Innovation Workshop held in New Delhi from 16-19 November 2017. India is also engaging with the private sector to boost investment in clean energy. Indian representatives participated in the Strategic Dialogues on Effective Public-Private Cooperation on Clean Energy Innovation held in Mexico in September 2017. Building on this theme a stakeholder meeting is being held in India on 20th December 2017 for investors from around India to learn about the opportunities to invest in clean energy innovation. Significant engagement with the private sector was enabled by the national workshops on the seven Innovation Challenges and most recently at the Second Mission Innovation Smart Grid Innovation Workshop held in New Delhi from 16th to 19th November 2017. 12 countries and the European Commission were represented at this workshop. All representatives agreed to the adoption of the New Delhi declaration confirming that they will continue to work together on agreed R&D priorities. National workshops on two other Mission Innovation Challenges of Converting Sunlight and Carbon Capture Innovation Challenges have also been conducted. In preparation for the smart grid workshop 14 of the 20 countries participating in this Innovation Challenge shared information on their smart grids strategies. This information has been collated and will be published later this month in the form of a Synthesis Report entitled “Smart Grid Innovation Challenge Country Report: Strategies, Trends and Exertions of Participant Countries (STEP)” on the Mission Innovation website. Participation of other Mission Innovation members in the Smart Grid Innovation Challenge is welcomed. Notable examples of new partnerships accelerated by Mission Innovation are two joint clean energy research centres. The UK-India Joint Virtual Clean Energy Centre has £10 million to undertake collaborative research programmes on energy generation, transmission and storage. India has supported two consortia led by Indian Institute of Technology Kharagpur and Indian Institute of Technology Bombay to interface with the Joint UK-India Clean Energy Centre in the UK. The U.S.-India collAborative for smart diStribution System wIth STorage (UI-ASSIST) has $30 million to conduct research and deploy new smart grid and energy storage technologies. The Indian Institute of Technology Roorkee has also developed a Memorandum of Understanding on smart grids with Ricerca sul Sistema Energetico in Italy. The recent launch of the @IN_MissionInnov twitter account demonstrates India’s intention to tell the world about its Mission Innovation activity and to increase awareness of the transformational potential of energy innovation. The team will report annually, before each Mission Innovation Ministerial, on the progress of the national Mission Innovation Action Plan. In conclusion, Dr Sanjay Bajpai of the Indian Department of Science & Technology was pleased to report that Mission Innovation has increased the focus on clean energy R&D in India as awareness of the power of innovation is being raised, resulting in the acceleration of the implementation of India’s clean energy innovation plan. To find out more about India’s Mission Innovation activities please contact Dr. Renu Swarup, Senior Adviser, Department of Biotechnology or Dr. Sanjay Bajpai, Scientist ‘G’/ Adviser, Department of Science and Technology.